A helicopter crashed down on U.S. Highway 101 in Salinas Friday morning, sending its pilot to the hospital and snarling traffic. 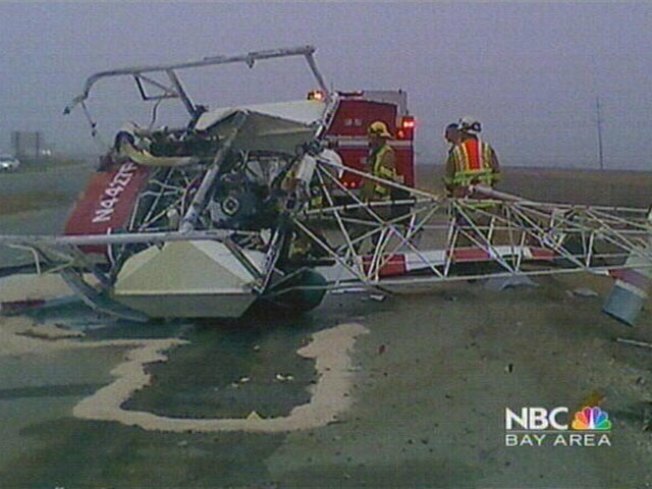 The California Highway Patrol says the crop-dusting helicopter landed upside-down on Highway 101 shortly after 6 a.m., barely missing a tractor trailer. The crash happened near Salinas Municipal Airport. The helicopter was blocking both southbound lanes of Highway 101 just south of Airport Boulevard, CHP Officer A. Paulson said. The pilot was able to walk away from the wreck but complained of pain, Paulson said. He was taken to a hospital for evaluation. No one else was on board. The pilot told authorities that he had been towing water, which spilled onto the road. Some diners who had just finished a meal at the Denny's restaurant on nearby De La Torre reportedly ran back into the restaurant and told the staff that a helicopter had crashed on the highway, according to a Denny's waitress. The helicopter remained in southbound lanes of the highway, blocking traffic as the Labor Day weekend approaches. Paulson says one southbound lane reopened around 7:45 a.m.